IF WE HAD WIFI WE PROBABLY WOULDN'T HAVE GOTTEN LOST! I can't remember the number of times we uttered that phrase out of frustration during our first barkada trip to Japan earlier this year. Out of all the countries I've visited, Japan was one of the most difficult to navigate due to its vast subway systems and a serious language barrier problem. If we had wifi, we probably would have been able to visit more places and saved loads on transportation costs. WHY DIDN'T WE HAVE AN INTERNET CONNECTION? We relied on our AirBnb to provide us with our pocket wifi. Our apartment had one but it wasn't working. (Same thing happened to me during 2 other trips, so I've learned my lesson). And that's why I decided to give FlytPack a try. For just Php220/day, I had fast, reliable AND UNLIMITED wifi service all throughout my one week stay in HongKong! I used to purchase local sim cards each time I travel so I could place calls, etc., but now that both of my phones are locked with local networks, I'm not able to use 3rd party sims. It's kind of a blessing in disguise. I used to have to tether my phone with the local sim to my other phones just so I could access iMessage, Viber and Whatsapp. I found it cumbersome, not to mention having to pop into a convenience store to top up. Flytpack provides fast internet service so I'm able to place calls and send messages via wifi through a crystal clear connection. All you need to do to get started is turn it on! You can connect up to 10 devices + no guessing games required! You can easily view your username and password via the small screen on the router so you can easily share your connection with friends and family! During my entire trip, I never encountered a location without coverage. If there are times when your device loses signal, simply turn on and off. Flytpack is available all over the world, rates range between Php180-Php550/day depending on where you're traveling to. 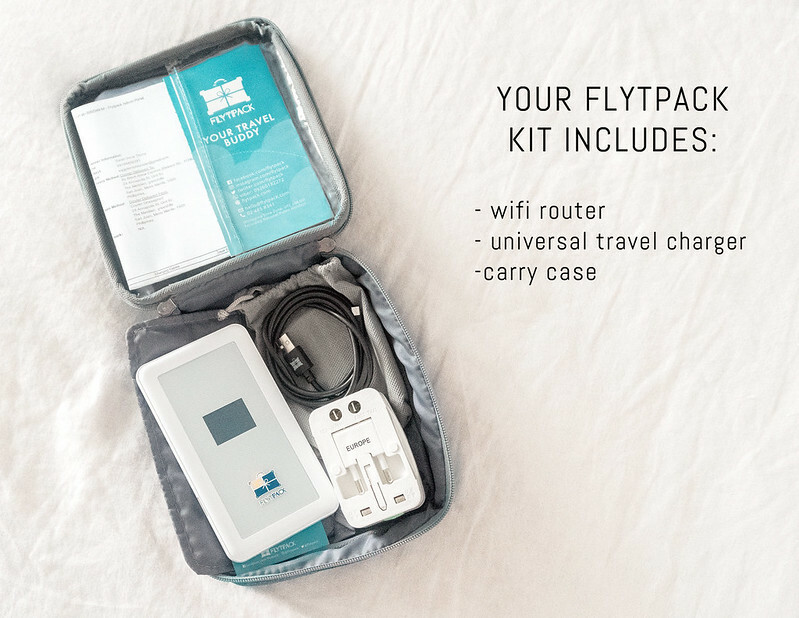 Super convenient - book and pay online at www.flytpack.com and just wait for your router to be delivered at the convenience of your own home. They also pick it up a day after your return from your trip! Reliable - I was always connected at super fast internet speeds. Affordable - I only paid Php220/day, cheaper than roaming or purchasing a local sim with LTE. Flytpack is the best travel wifi router provider I've ever tried. It's a definite must-have for everyone who travels most especially if you have urgent business dealings at home that need to be attended to while you're away. never get lost, access google maps or uber anytime with Flytpack! FOR MORE INFO, visit: www.flytpack.com or connect with them via Facebook.